HydroClean conveyors from QC Industries deliver efficient product movement in demanding sanitary environments. Food applications—produce, snack foods, baked goods, and prepared foods—are typical, but this conveyor is also used in medical device, pharmaceutical, and other clean applications. The standard for in-place cleaning: Tension release tail flips up to effortlessly remove belt tension. This makes it extraordinarily easy to remove the belt and clean underneath it. Built with sealed ball bearings with stainless steel cover for protection during cleaning. Hex head fasteners offer no exposed threads where bacteria can accumulate. Extremely quiet: Excellent ergonomics for close quarters with workers. Tool-free drive & tail removal means easier maintenance and cleaning: Due to its unique pull-pin design, the HydroClean series can be completely disassembled without any tools. Everything can come apart and reassemble by hand. BISSC certified and built to NSF Standards: Minimal mated surfaces can be disassembled for easy cleaning. Also built with slotted frames and soft angles that promote drainage. Widths: 4", 6", 8", 10", 12", 18", and 24"
Stainless steel stands built with an open design for ease of cleaning, using the same pull-pin attachment for belt removal or leg assembly. Includes leveling feet and flip-down angle braces (enhance stability and remove easily with pull-pins). Extruded aluminum stands are ideal for applications that do not require stainless steel. Includes the same pull-pin construction, and leveling feet. 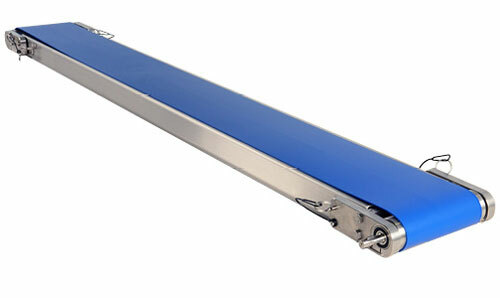 Casters available for both types of conveyor stands. Adjustable guides help channel conveyed product and prevent spills or drops. Guides easily removed without tools for cleaning and maintenance. Fixed sides help contain product (like small pieces or parts) on the conveyor belt. 1” and 2” available, with options for wear strips or indentions. Universal mounts help attach the conveyor to a workstation or other machinery. HydroClean conveyor is ideal for wet and sanitary environments. 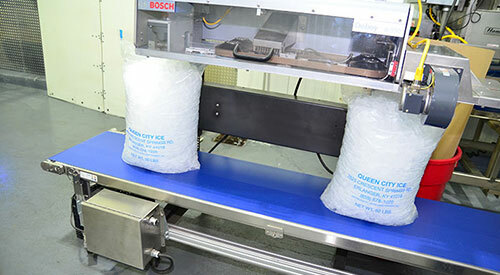 Used here on an ice packaging line.